A Slice of Life: From Hawaii with Love! 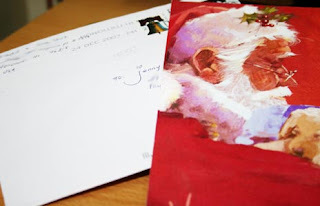 Wow, just 2 days ago the mailman handed me a card and when I read it was from my online friend Kitty. I was so happy and it was so sweet and thoughtful of her to send me a Christmas card. I know it took about 3 weeks to get here since it was stuck in the mail. Nevertheless i am still grateful for Kitty's sweetness.